I’m a Cumberbitch. A Sherlockian. A Holmie. A Baker Street Irregular. Whatever you want to call it, I’ve got it. And I’ve got it bad. 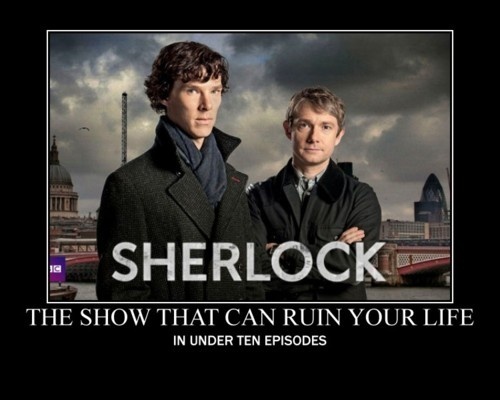 A few weeks ago, a friend of mine bought me Season One of Sherlock and told me that I would love it. Since I was snapping up whatever distractions I could, it was a welcome gift. But I didn’t realize what would happen once I watched those first three episodes. I was hooked quickly. And like any instantly obsessed TV junkie, I needed to catch the next seasons. 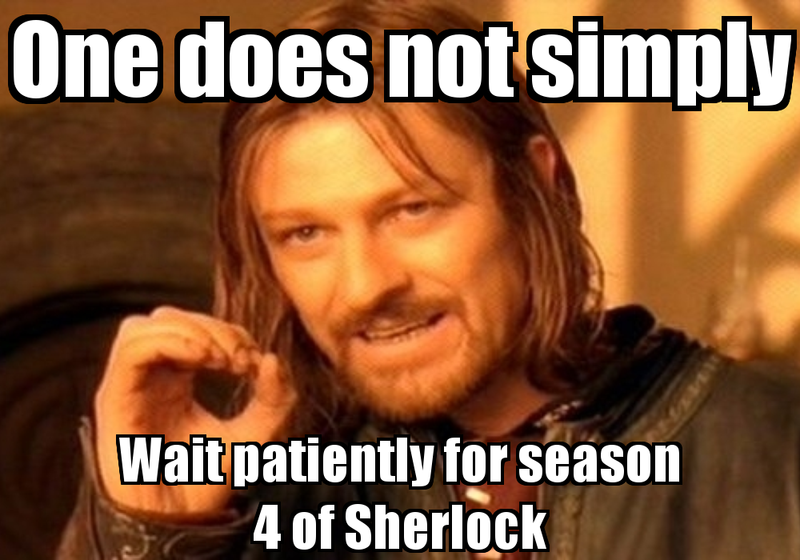 Luckily, all three seasons of Sherlock are available for streaming on Netflix. While this might seem like a perfect happy ending, it in fact proved disastrous. Netflix is fantastic for catching up on old shows and movies that you may have missed but it placed me in a ridiculously lonely place. Here I was, finishing up Season Two of Sherlock and was desperate to discuss it with someone, but I was a season behind. A few years behind, actually. And so there was no one to talk to, no one to compare theories with, no one. Just me. Alone on my laptop. I was an outcast. A loner. A CumberCollective of one. I suddenly realized what it must be like to read through all the Harry Potter books without having to wait for the next installment. So easy to just pick up the next edition and find out the truths that millions of people debated and argued over for years in between the publications. Netflix placed me in that awkward position of being a newbie fan. I became one of those people who I used to look at snidely – the ones who came to some fandom through a film rather than a book. Those posers! I tried to fit in. I really did. I looked up discussion forums from 2010. I went on websites to try and find anyone who would talk to me. I frantically remembered an Entertainment Weekly that had Sherlock on the cover that I purposely did not read because, after all, I wasn’t watching the show. And how could I have missed this show? What was I thinking? And where was that magazine?!? I was a nerd. A nerd without Netflix. I had to be responsible. And now, shirking all responsibilities, and in a stunning display of seriously selfish parenting, I am forcing my kids to watch Netflix instead of playing outdoors. To devote hours of TV time to Sherlock purely because I need to talk to someone who can understand. Even if that person is my 13 year old son. It’s a lonely, desperate world when you’re catching up on Netflix. My only consolation is that after I finish Season Three, I will be in the same boat as everyone else: waiting endlessly for Season Four to start. And then I can join in the discussions, save the magazines, and become a proper fan. Surrounded by like-minded souls and not just the wannabes surfing Netflix. Whoever those fans might be. Because you won’t find me hanging out with those impostors. ‹ Happy Fourth of July! Voyagers! and i love your posts. wish you’d post more often actually. Voyagers! Good Lord! That was such a terrible show! 🙂 Thanks for reading. I write a new post every Monday (for the most part). If I didn’t have a job or anything else then I would post more often. *sigh* But thanks for reading and visiting and commenting! It’s nice to have a fan! I try to have four or five series that I am watching on Netflix so I can really make three or four seasons last! I have had Sherlock in my queue for a long time but haven’t started it. The last one to leave me hanging was Murdock Mysteries. Excellent show. I hope you’re feeling good. Tracy, you really need to start watching Sherlock before Season 4 starts up. I cannot stress it enough. It is just that good. Trust me on this. hmmm, I guess I will have to move it up the list! I am so sorry… this is all our fault.